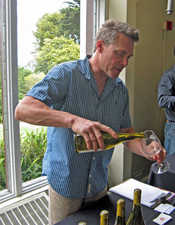 Report on the 6th Annual Taste of Mendocino, presented by Mendocino Winegrowers, Inc. and Visit Mendocino County on Tuesday, June 10th, 2014, at the Golden Gate Club in the Presidio of San Francisco, California. The event features an extensive tasting of wines sourced from vineyards throughout Mendocino County. Taste of Mendocino is more than just a wine tasting event – it’s been described as a “showcase of all the people and products that make Mendocino County such a special destination for wine lovers, outdoor enthusiasts and rebels.” The event was hosted this year by Mendocino Winegrowers, Inc. and Visit Mendocino County. Mendocino Winegrowers, Inc. supplanted the old Mendocino Winegrape & Wine Commission in late 2012. The non-profit organization is made up of Mendocino vintners and winegrape growers, and it seeks to “promote the premium quality of our grapes and wines, and direct further interest toward our special part of the world.” Visit Mendocino County is the official travel and tourism organization of Mendocino County, offering information to visitors and working with county businesses to help promote awareness of the area’s attractions and support for tourism. Mendocino County promotes itself as “America’s Greenest Wine Region.” The county features the nation’s first organic winery (Frey Vineyards), first solar-powered winery (McDowell Valley Vineyards), first carbon-neutral winery (Parducci), first 100% “off-grid” winery (Philo Ridge), California’s largest certified organic grape grower (Fetzer), and the nation’s largest producer of organic wine (Bonterra). 24% of Mendocino’s winegrapes are grown in certified organic or biodynamic vineyards – one of the leaders in the country. The county’s wine history goes back to the 1850s, when the first vineyards were planted, and the first Mendocino County winery was established in 1879. Today, the county includes ten separate AVAs, and is home to over 90 bonded wineries and over 16,000 acres planted among nearly 350 vineyards. This was my third time at the Taste of Mendocino event. It was held during the afternoon and early evening, with the early afternoon portion open to trade and media and the late afternoon and evening portion open to the general public as well. This was the second year that the event was held at the Golden Gate Club at the San Francisco Presidio, a handsome building that started as the enlisted men’s service club when it was built in 1949. Winery tables were arranged in two large rooms of the building, which boasts spectacular views of San Francisco Bay. In addition to the main tasting event, there were three workshops that were held in a side room at the Golden Gate Club. The first was on sparkling wines from Mendocino, a region that produces some of the most acclaimed sparklers in California. Next was a focus on Pinot Blancs from a single vineyard, Schrader Ranch just south of Ukiah, while the final workshop featured 2012 Zinfandels from inland Mendocino. While I’m sure I would have enjoyed these workshops, I stuck with the main tasting. It would have been nice to have one or more of the workshops at a separate time from the main tasting, but I understand the logistical difficulties this might have presented. 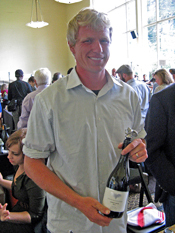 Over 30 wineries poured at this year’s Taste of Mendocino. The event attracts a strong and representative group of vintners from the county. I missed seeing a few very good producers who didn’t pour this year, including Baxter, Elke, and Witching Stick, but there was still a fine line-up of wineries who participated. This is a unique event meant to showcase the best of Mendocino County, bringing together not only wineries but representatives from many other businesses as well. Tables at the event also included a distiller, coffee company, a number of other food purveyors and growers (I sampled a few delicious snacks throughout the afternoon), visitor agencies, area attractions, and other vendors and businesses – a great showcase for the diversity of Mendocino County. One wine-related table this year is worthy of special mention. Highlighting the 10th anniversary of the Coro Mendocino program, the table featured “Coro Mendocino” wines from a number of producers. 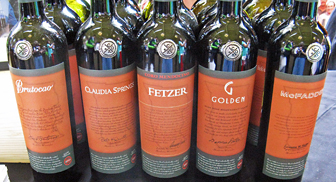 The first appellation-specific wine produced in the United States, these bottlings share common packaging, an identical price, and a similar Zinfandel-based blend meant to express the distinctive character of the county’s fruit. The participating wineries – 10 producers made “Coro Mendocino” wines in 2010 – must use a blend that includes between 40% and 70% Zinfandel, aged for a minimum of one year in 25% to 75% new oak plus a minimum of one more year in bottle prior to release. There are other requirements with acceptable ranges of alcohol, acidity, pH, and other elements with which the wines must comply, and there is also a rigorous series of blind-tasting peer reviews that each wine must pass before it can be released. Some fine wines have been produced over the years under the Coro Mendocino program. It’s a fascinating concept and as far as I know, still the only program of its kind in the country. 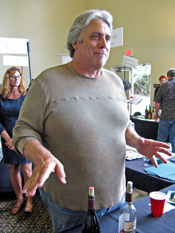 As I have found in previous years, Taste of Mendocino is an ideal way to try wines from both cooler coastal areas and the warmer inland wine regions of the county at a single event. About half the winery tables I visited featured wines from Anderson Valley and nearby areas such as Mendocino Ridge and Yorkville Highlands, and half were from other parts of the county. There are still quite a few producers from Mendocino with whom I have limited experience (or none at all), and I managed to visit a good number of them during this tasting. I had recently been to the Anderson Valley Pinot Noir Festival, so I skipped over many Pinots from there that I had already tasted, though I enjoyed many other wines from Anderson Valley producers. And as is nearly always the case with tastings such as this, some producers included one or more wines made from fruit sourced outside Mendocino County – some of these wines were quite good but I did not include them in my list of Favorites. As has been the case at past Taste of Mendocino events, my list of Favorites reflects the diversity of wines from Mendocino County, in terms of both wine regions and grape varieties. There are over a dozen kinds of varietal bottlings represented, plus several blends. White and Rosé wines from 2012 and 2013 showed especially well – strong across the board from various parts of the county. In addition to my main Favorites list, I included an “Others of Note” section for wines that were just a notch (or even a half-notch) below my other Favorites but still worthy of mention. 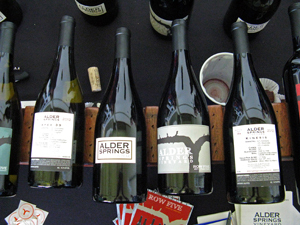 Several producers stood out at this year’s tasting, including Alder Springs, Drew, and Husch. Eric Demuth and Skylark also presented strong line-ups, though they included some wines made from non-Mendocino fruit in addition to their Mendocino bottlings. Golden’s lone wine – their “Coro Mendocino” – was a standout. One of the most fun things about attending a tasting such as this one is discovering new and promising wineries. Newer producers Campovida, Judson Hale, and Via all made strong impressions, and they all landed a wine on my list of Favorites. Taste of Mendocino is a fun event, with much more to check out than just wineries. It presents a good overview of the county’s many attractions in an intimate and relaxed format. I found plenty of enjoyable wines, representing a broad range of varieties, styles, and price ranges. 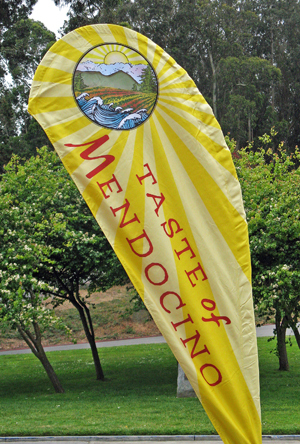 Taste of Mendocino continues to be a fine showcase for Mendocino County, and I’m looking forward to returning next year. Row Five 2011 Marsanne / Viognier, Alder Springs Vineyard, Mendocino County. 69% Marsanne, 31% Viognier. Light yellow color, with bright citrus fruit, herbs, and a stony/mineral component. Medium-light bodied with a vibrant texture and clean finish, nice. Alder Springs 2010 Chardonnay, Alder Springs Vineyard, Mendocino County. Made in 30% new oak. Light color, showing vanilla/oak aromas upfront, plus spice and stone fruit notes. Medium weight on the palate with a fairly rich texture and smooth finish. Alder Springs 2012 “Apex 39,” Alder Springs Vineyard, Mendocino County. 54% Roussanne, 29% Marsanne, 17% Viognier – the fruit for this wine comes from the apex of the vineyard, located on the 39th parallel. Light color, this had riper stone fruit and fig on the nose, along with spice and a touch of sweet oak. Medium-bodied with a livelier mouthfeel and finish than the Chardonnay – worth aging this to see how it develops. Row Five 2011 Pinot Noir, Alder Springs Vineyard, Mendocino County. Medium-light color, displaying pretty floral aromas, plus raspberry fruit, spice, and a hint of vanilla/oak. Medium-light bodied, with bright acidity and a clean finish – not especially complex but quite pleasant. Alder Springs 2012 “Kinesis,” Alder Springs Vineyard, Mendocino County. Not yet released, 62% Grenache, 19% Mourvèdre, 19% Counoise. Medium-light purple color, with bright cherry and raspberry fruit, black pepper, earth, and a chalky mineral note. Medium weight in the mouth with good structure and a chewy tannic finish – tasty now but this will need more time in the cellar to show its best. Row Five 2012 “Red Cuvée,” Alder Springs Vineyard, Mendocino County. 49% Syrah, 33% Pinot Noir, 12% Malbec, 3% Mourvèdre, 3% Counoise. Medium purple, showing a blackberry, earth, dried herbs, and spice on the nose. Medium-full bodied, this finished with firm tannins. Comments: Owned by Stuart Bewley, Alder Springs Vineyard is located in far northern Mendocino County, and has been a source of top-notch fruit for other wineries for many years. Several noted winemakers have produced wines for the Alder Springs label, with Byron Kosuge taking over in spring of 2012. Row Five is a second label featuring more early-drinking bottlings. This was a strong line-up of wines. Balo 2012 Pinot Gris, Anderson Valley. Sourced from Donnelly Creek Vineyard, aged on the lees in stainless steel and neutral oak. Light straw color, this featured apple/pear fruit, fresh herbs, and an earthy note. Medium-light bodied, with zippy acidity and a crisp finish, nice. Balo 2013 Vin Gris of Pinot Noir, Anderson Valley. Mostly whole-cluster pressed and made entirely in stainless steel. Very light salmon/pink, with strawberry, herbs, and hints of flowers and spice. Medium-light weight and lively on the palate, with a clean finish. Comments: Balo was founded in 2009 by growers Tim and Michele Mullins, and the wines are made by Jason Drew. The estate Balo Vineyard is in the Philo area and was first planted in 1998. It’s farmed organically, though not yet certified. I passed on tasting Balo’s fine Pinot Noirs since I’d tasted them at another recent event. Girasole 2013 Pinot Blanc, Mendocino County. Made entirely in stainless steel. Very light straw color, showing leesy and earthy notes upfront, with pear and melon fruit in support. Medium-light bodied with a fairly smooth mouthfeel and finish. Girasole 2010 “Hybrid Red,” Mendocino County. 45% Cabernet Sauvingon, 40% Merlot, 15% Syrah. Medium-light purple, this had plum and darker berry fruit, touches of earth and spice, and undertones of oak. Medium weight in the mouth, with milder tannins. Barra 2011 Zinfandel, Estate, Mendocino County. Medium-light purple, with ripe black cherry fruit, lots of spice, and vanilla/oak on the nose. Medium-light bodied with a firm tannic finish. Comments: All of the fruit for these wines comes from the certified organic estate vineyard in Redwood Valley, first planted by Charlie Barra in the 1950s. Jason Welch is the winemaker for both the Barra and Girasole labels. Bink 2013 Sauvignon Blanc, Randle Hill Vineyard, Yorkville Highlands. From an organically-farmed vineyard, made entirely in stainless steel. Very light straw color, featuring bright citrus and stone fruit, fresh herbs, and a slight floral note. Medium-light weight with vibrant acidity and a crisp finish, nice. Bink 2013 Sauvignon Blanc, Old Chatham Ranch, Yorkville Highlands. Made in stainless steel and older oak. Very light straw color, this showed apple and pear fruit, earth, and a touch of herbs. Smoother and creamier texture than the previous wine, with a chalky mineral note on the finish. Bink 2013 “Lumineux,” Hawk’s Butte Vineyard, Yorkville Highlands. A Merlot-based Rosé, from fruit destemmed and left overnight before pressing, made entirely in stainless steel, with no malolactic fermentation. Very light salmon/pink, with subdued red fruit and earth on the nose. Medium-light bodied with a fairly smooth texture and finish. Bink 2009 Cabernet Sauvignon, Old Chatham Ranch, Yorkville Highlands. Medium purple color, with currant and plum, lots of spice, and hints of tobacco and mocha. Moderately rich mouthfeel, finishing with medium tannins. Comments: Bink was founded in 2003 by Cindy Paulson and winemaker Deb Schatzlein, who was on hand to pour her wines. Bink owns noted Hawks Butte Vineyard at about 1,200-foot elevation in the Yorkville Highlands just southeast of Anderson Valley, where they grow Syrah and Merlot. I skipped Bink’s Pinot Noirs since I’d tasted them recently at another event. Brutocao 2010 “Coro Mendocino,” Mendocino County. 66% Zinfandel, 20% Barbera, 14% Primitivo. Medium purple color, this showed plenty of spice upfront, along with black cherry and plum fruit, earth, and a touch of sweet oak. Medium-bodied with moderate tannins on the finish. Comments: Irv Bliss bought property in 1943 that’s now home to Bliss Ranch. After the Brutocao family married into the Bliss family, they joined together to farm winegrapes and make wine, with the first Brutocao wines coming from the 1980 vintage. They make their wines on the property, and David Brutocao is the winemaker. This wine was tasted at the Coro Mendocino table. Campovida 2013 Rosé di Grenache, Trail’s End Vineyard, Mendocino County. From a vineyard in Potter Valley, the wine was aged in neutral oak with no malolactic fermentation. Very light salmon color, with bright strawberry and citrus aromas with hints of fresh herbs. Medium-light bodied with bright acidity and a chalky note on the finish. Campovida 2013 Arneis, Spirit Canyon Vineyard, Mendocino County. From a vineyard a few miles north of Hopland, kept on the skins for 12 hours before pressing into stainless steel, aged in neutral oak with no malolactic fermentation. Light straw color, this displayed stone fruit, pear, and lemonpeel along with a slight floral note. Medium-bodied with a chalky texture and a fresh, crisp finish, nice. Campovida 2013 “Campo di Stelle Riserva,” Randle Hill Vineyard, Yorkville Highlands. 80% Sauvignon Blanc, 20% Semillon, from an organically-farmed vineyard, barrel-fermented and aged in neutral French oak. Very light color, with upfront grassy/herbal aromas, plus fig and grapefruit. Medium weight on the palate with a richer texture than the Arneis, and a fairly smooth finish. Campovida 2012 Grenache, Dark Horse Vineyards, Mendocino County. 100% Grenache from a biodynamically-farmed vineyard between Hopland and Ukiah, aged in neutral oak. Medium light color, showing ripe red fruits, spice, and undertones of oak. Medium-bodied and structured, finishing with firm tannins. Campovida 2012 “Campo di Rossa Riserva,” Mendocino County. 62% Grenache, 18% Syrah, 16% Carignane, 4% Petite Sirah from four sites, all organically- or biodynamically-farmed (including certified organic estate-grown Grenache), aged in neutral oak. Medium color, with a ripe darker fruit profile along with earth and spice. Medium-bodied with a bigger texture than the previous wine, and a grippy tannic finish. Comments: Owners Gary Breen and Anna Beuselinck established this new venture (first vintage in 2012) in Hopland, at the site that had been the Fetzer Wine Hospitality Center. They run a family-owned farm and vineyard, and Sebastian Donoso is their winemaker. Sebastian, a native of Chile, was on hand to pour the wines at the event. Claudia Springs 2010 “Coro Mendocino,” Mendocino County. 41% Zinfandel, 32% Primitivo, 10% Petite Sirah, 10% Grenache, 7% Carignane. Medium purple color, showing upfront cherry and raspberry fruit along with earth, spice, and a touch of black pepper. Medium-bodied with good structure and a grippy tannic finish. Comments: Bob and Claudia Klindt founded their vineyard and winery near Navarro in Anderson Valley in 1989. Over the years, many of the Claudia Springs wines have come from grapes grown in warmer Redwood Valley. This wine was tasted at the Coro Mendocino table. Eric Demuth 2012 Chardonnay, Demuth Vineyard, Anderson Valley. From 25+ year old Wente clone vines, fermented in 50% stainless steel and 50% oak, mostly neutral. Very light straw color, with citrus and apple, spice, and lees aromas. Medium-full bodied, combining a creamy texture with lively acidity, with a chalky sensation on the long finish, nice. Eric Demuth 2012 Pinot Noir, Russian River Valley. 60% whole-cluster fermentation, aged in five-year old barrels. Medium-light color, this showed floral and savory aromas upfront, with bright red fruits, earth, and spice in support. Medium-light weight on the palate with a lively mouthfeel and finish – not a typical RRV Pinot but quite nice. Eric Demuth 2012 Syrah, Bei Ranch, Sonoma Coast. 99.5% Syrah, 0.5% Viognier, from a cool-climate site at 1,600-foot elevation to the west of Cazadero, 100% whole-cluster fermentation, 85 days on the skins, aged entirely in neutral barrels. Medium purple, featuring herbal and slightly floral aromas, plus blackberry and earth notes. Medium-light bodied, this had a bright texture and fine tannins – a promising young Syrah. Demuth Kemos 2010 Cabernet Sauvignon, Clajeux Vineyard, Chalk Hill. 33% whole-cluster fermentation, left on skins for 50-65 days. Medium-dark color, with intense red and black fruits, dried herbs, and spice on the nose. Medium-bodied with a vibrant mouthfeel and refined tannins – already intriguing but deserving of time in the cellar. Comments: Demuth Kemos was founded in 2004 by Eric Demuth and Peter Kemos, and the winery has focused on Chardonnay, Syrah, and Cabernet Sauvignon. Eric and his father planted highly-regarded Demuth Vineyard high in the hills above Boonville in 1982. Peter is no longer part of the business and the winery name is changing to Eric Demuth Wine Company. Eric poured a solid group of wines at the tasting. 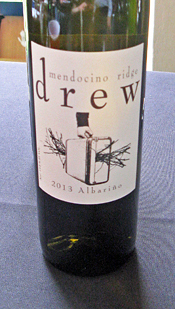 Drew 2013 Albariño, Mendocino Ridge. Sourced from Valenti Vineyard, vines grafted from “suitcase” cuttings from another site (which inspired the label). Very light straw color, this featured bright green apple and citrus, herbs, and a stony mineral note. Medium-light bodied with a vibrant texture and crisp finish, nice. Drew 2012 Pinot Noir, Balo Vineyard, Anderson Valley. From Pommard, 115, and 777 clones, 20% whole-cluster fermentation, aged in 33% new oak. Medium-light ruby color, with a savory/herbal character along with black cherry and forest floor notes. Medium weight with a lively mouthfeel and finish. Drew 2012 Syrah, Perli Vineyard, Mendocino Ridge. 30% whole-cluster fermentation, co-fermented with 5% Viognier, aged in three-year old oak. Medium purple, with blackberry fruit, spice, and herbs, plus touches of black pepper and smoked meat. Medium-bodied with plenty of structure and big but refined tannins on the long finish – nice now but very worthy of time in the cellar. Comments: Jason and Molly Drew founded their winery in 2000, and moved from their original base in Santa Barbara County to Mendocino after purchasing property in the Mendocino Ridge area in 2004, not much more than three miles from the ocean. They planted seven acres with eight Pinot clones in 2011. The vineyard is certified organic and the Drews expect their first harvest this year. As usual, Jason Drew poured a strong line-up of wines. Edmeades 2012 Zinfandel, Mendocino County. 87% Zinfandel and 9% Syrah, 4% Petite Sirah, aged in 15% new French and American oak. Medium purple color, this showed red fruits, lots of spice, and touches of black pepper, earth, and vanilla/oak. Medium-boded with a fairly smooth texture and moderate tannins. Edmeades 2011 Zinfandel, Piffero Vineyard, Redwood Valley. 100% Zinfandel from 70+ year old vines, aged in 34% new oak. Medium color, with a darker and more brambly fruit profile along with a bigger earth component, spice, and black pepper. Medium weight in the mouth with vibrant acidity and a firm tannic finish, nice. Edmeades 2011 Zinfandel, Shamrock Vineyard, Mendocino County. 100% Zinfandel from a newer 2,800-foot elevation vineyard near the Humboldt border, aged in 5% new oak. Slightly darker color, with riper boysenberry and raspberry fruit, spice, and more pronounced sweet oak on the nose. Richer texture, finishing with big but refined tannins. Comments: Dr. Donald Edmeades planted the first post-Prohibition commercial vineyard in Anderson Valley in 1963, and the Edmeades label was launched in 1972. Long-known for its Zinfandels, the winery has been owned by Jackson Family Wines since 1988. Golden 2010 “Coro Mendocino,” Mendocino County. 50% Zinfandel, 27% Syrah, 23% Petite Sirah. Medium-dark color, featuring dark berry fruit, spice, earth, and a distinct stony mineral component. Medium-bodied with good structure and firm tannins on the long finish, nice. Comments: Joe and Julie Gordon’s Heart Arrow Ranch near Redwood Valley and Fairbairn Ranch in the Hopland area are both farmed biodynamically. They sell fruit to several noted wineries as well as producing “Coro Mendocino” wine under the Golden label, with their first vintage coming in 2001. The wine is made by veteran Mendocino winemaker Dennis Patton. This wine was tasted at the Coro Mendocino table. Handley 2012 Chardonnay, Estate, Anderson Valley. Made in stainless steel and in French oak barrels and a foudre (about 20% new oak). Light straw color, this showed bright apple and citrus notes with touches of spice, vanilla/oak, and chalky minerals. Medium-light bodied with a lively mouthfeel and finish, nice. Handley 2013 Gewürztraminer, Anderson Valley. A dry Gewürztraminer sourced from three vineyards, made in stainless steel and neutral oak. Very light straw color, with earth, lychee, and citrus on the nose. Medium-light bodied with a slightly bitter finish. Handley 2013 Riesling, Anderson Valley. Made in stainless steel and neutral oak, 0.3% residual sugar. Very light color, displaying floral aromas along with ripe stone fruit and tropical fruit. Medium weight and lively on the palate with a mildly sweet finish. Handley 2010 Pinot Noir, Anderson Valley. Sourced from seven vineyards, aged in 25% new oak. Lighter ruby color, black cherry and forest floor on the nose, along with a touch of vanilla/oak. Medium-bodied with moderate tannins. Handley 2010 Pinot Noir, RSM Vineyard, Anderson Valley. The 7-acre estate RSM Vineyard was planted from 1999-2001. From mostly 115 clone plus some 667 and Pommard, aged in 33% new French oak. Medium-light color, this featured lots of spice, plus black cherry, earth, tea leaf, and sweet oak. Bigger structure than the previous wine, finishing with firmer tannins. Comments: Founded in 1982 by winemaker Milla Handley, the estate vineyard near Navarro has been certified organic since 2005. Pinot Noir, Chardonnay, and Gewürztraminer are planted there. Several of Handley’s aromatic white wines are bottled under screwcap. Husch 2013 Sauvignon Blanc, Mendocino County. With fruit from multiple picks at La Ribera Vineyard, located between Ukiah and Hopland, the wine was made entirely in stainless steel. Light straw color, with herbal/grassy citrus and stone fruit aromas. Medium-light bodied, with bright acidity and a clean finish, nice. Husch 2013 Dry Gewürztraminer, Anderson Valley. From the estate vineyard, made in stainless steel. Very light color, this showed citrus and spice on the nose, with milder touches of flowers and lychee. Medium-light weight with a richer texture than the previous wine and a slight bitter note on the finish. Husch 2012 Pinot Noir, Anderson Valley. Fermented with 25% whole clusters, aged in 25% new French oak. Light ruby color, featuring earth and mushroom aromas along with black cherry and tea leaf notes. Medium-light bodied with a lively mouthfeel and finish – nice, and very representative of Anderson Valley Pinot. Husch 2012 Zinfandel, “Old Vines,” Mendocino County. Sourced from Garzini Ranch in Ukiah Valley, originally planted in 1921. Medium-light purple, with lots of spice and pepper plus boysenberry and raspberry fruit and a hint of sweet oak. Medium-light bodied with a juicy texture and moderate tannins on the finish, nice. Husch 2011 Cabernet Sauvignon, Mendocino County. Sourced from La Ribera Vineyard, barrel-aged in 25% new French and American oak. Medium purple color, this displayed herbs, plummy fruit, earth, and touches of stony minerals and vanilla/oak. Medium-bodied with good structure and firm tannins on the lively finish. Comments: Located between Philo and Navarro, Husch is the oldest winery in Anderson Valley – it was established by Tony and Gretchen Husch in 1971. The winery has been owned by the Oswald family since 1979. The current proprietors, Zac Robinson and Amanda Robinson Holstine, are the third generation of the Oswald family at Husch, and Brad Holstine is the winemaker. This was a strong showing for the Husch wines. Il Cuore 2012 Chardonnay, Mendocino County. 94% Chardonnay, 6% Viognier, fermented in stainless steel and aged in mostly neutral oak. Light straw/yellow color, this showed bright floral and citrus aromas, plus notes of lees and herbs. Medium-light bodied with a lively mouthfeel and finish, nice. Il Cuore 2012 Zinfandel, Mendocino County. 76% Zinfandel, 18% Petite Sirah, 6% Sangiovese, sourced from three vineyards. Medium purple color, with raspberry and black cherry fruit, spice, earth, and black pepper on the nose. Medium weight on the palate with moderate tannins on the finish. Il Cuore 2012 Barbera, Mendocino County. 86% Barbera, 14% Petite Sirah, sourced from three vineyards. Medium-light color, displaying bright cherry and spice aromas along with touches of earth and oak. Medium-light bodied with vibrant acidity and moderate tannins. Comments: Producing value-oriented wines, the first Il Cuore release was from 1989 vintage. Longtime Mendocino vintner Dennis Patton makes the wines. Il Cuore is part of the Dreyer Wine Company, whose other labels include Compass, Dreyer Sonoma, Seabiscuit, and Solitude. The three wines I tasted were not especially complex but quite pleasant (and fine values), with bright acidity that should pair well with a variety of foods. Judson Hale 2012 Chardonnay, Yorkville Highlands. Fermented in stainless steel, aged in neutral French oak, 50% of the wine went through malolactic fermentation. Light yellow color, featuring ripe stone fruit and tropical fruit, spice, and lees on the nose. Medium-bodied with a lively mouthfeel and spicy finish. Judson Hale 2010 Pinot Noir, Walsh Ranch, Yorkville Highlands. Aged in neutral French oak. Medium-light garnet color, this had lots of spice upfront along with black cherry fruit and a tea leaf note. Medium-bodied with a fairly smooth texture and milder tannins. Judson Hale 2011 Pinot Noir, Walsh Ranch, Yorkville Highlands. Aged in older oak. Medium-light color, with a brighter red fruit profile than the previous wine, along with earthy, savory, and smoky notes. Medium weight on the palate, with a brighter mouthfeel and more lively finish, nice. Comments: Judson Hale is a new venture, and the 2012 Chardonnay and 2010 Pinot are the initial releases. Judson and his wife Lisa launched the winery together with the Walsh family, whose vineyard planted in 1996 supplies their Pinot fruit. Judson was on hand with his father-in-law Dennis Walsh to pour the wines at the tasting. The 2011 Pinot in particular was a standout. Knez 2012 Chardonnay, Demuth Vineyard, Anderson Valley. From Old Wente clone vines, aged for 12 months in 35% new French oak. Light yellow-straw color, this displayed apple and spice aromas along with touches of lemonpeel and vanilla/oak. Medium-light weight on the palate with a creamy texture and lively acidity. Comments: Proprietor Peter Knez purchased both Cerise and Demuth vineyards a few years ago, and in 2009 he planted the new Knez Vineyard between the two, all located high above Boonville. Cerise Vineyard was planted in 1995 with ten Pinot clones, while Demuth was planted in 1982, with Pommard and Wädenswil clones. 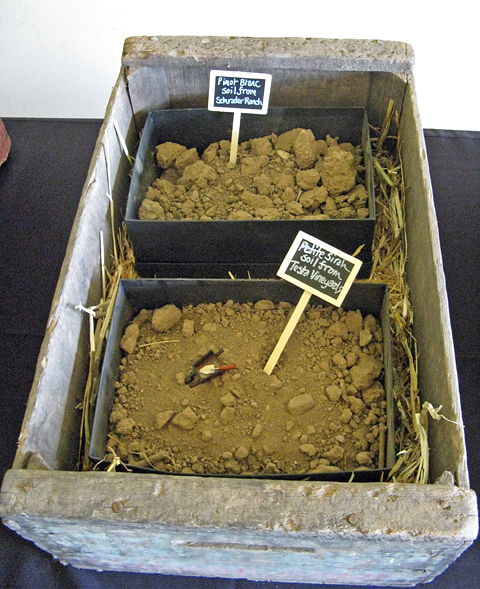 Farming of the vineyards is transitioning to biodynamic. Anthony Filiberti is the winemaker. Knez continues to produce some standout wines. I’d tasted the Knez Pinots at another recent event, so I skipped them on this occasion. Lula 2013 Rosato, Mendocino County. Made from five clones of Pinot Noir, soaked on the skins for about three hours, and made entirely in stainless steel. Light pink color, with bright strawberry, spice, and earth on the nose, plus touches of flowers and fresh herbs. Lighter-bodied with juicy acidity and a slight tannic bite on the finish, nice. Lula 2011 Pinot Noir, Mendocino County. From Pommard, 115, and 777 clones, aged in 40% new French oak. Medium-light color, with bright and spicy red fruits, along with earth and undertones of sweet oak. Medium weight on the palate with a lively mouthfeel and moderate tannins. Comments: Founded in 2010, Lula is the project of veteran winemaker Jeff Hansen. He sources his Pinot fruit from two vineyards in Comptche area, a few miles north of Anderson Valley, and more recently planted a vineyard in the Philo area – the first harvest for that should be in 2015. The winery is named for Jeff’s grandmother. McFadden 2013 Pinot Gris, Estate, Potter Valley. Made from organically-grown fruit. Very light straw color, this had apple and pear fruit plus spice on the nose. Medium-light bodied with a slightly chalky texture and finish. McFadden 2013 Gewürztraminer, Estate, Potter Valley. Made from organically-grown fruit, whole-cluster pressed and fermented in stainless steel. Light straw color, with classic lychee and floral aromas, along with touches of citrus and spice. Medium-light weight in the mouth, with a clean, smooth finish, nice. McFadden 2013 Riesling, Estate, Potter Valley. From 43-year old vines. Light straw color, showing ripe stone fruit and fresh herbs, and slight floral note. Richer and smoother in the mouth, this had a slightly sweet finish. McFadden 2012 Zinfandel, “Old Vine,” Mendocino County. Lighter purple color, this featured plummy fruit, earth, and a touch of black pepper on the nose. Lighter-bodied, finishing with mild tannins. McFadden 2010 “Coro Mendocino,” Mendocino County. 57% Zinfandel, 31% Syrah, 12% Petite Sirah. Medium-light color, with higher-toned red and black fruits, lots of spice, and a touch of sweet oak. Medium-bodied with a fairly smooth mouthfeel and finish. Comments: Proprietor Guinness McFadden has farmed his land in Potter Valley for over 40 years. The McFadden wine label was launched in 2003, while much of the vineyard’s fruit continues to be sold to many other noted wineries as well. McNab Ridge 2010 “Coro Mendocino,” Mendocino County. 63% Zinfandel, 32% Petite Sirah, 5% Pinotage. Medium purple, this displayed floral notes along with earthy dark fruit, spice, and touches of black pepper and sweet oak. Medium-full bodied, this finished with grippy tannins – this shows potential but will need time in the cellar. Comments: Winemaker Rich Parducci heads up the McNab Ridge label. His grandfather, John Parducci, who passed away earlier this year at the age of 96, was one of Mendocino’s wine pioneers and worked alongside Rich until recent years. John’s father Adoph Parducci founded his eponymous winery in 1932, although the family no longer has a connection with that label. They purchased McNab Ridge in 1999. Navarro 2013 Pinot Grigio, Anderson Valley. A higher-acid version of the wine that Navarro usually labels at Pinot Gris. Very light straw color, showing apple and stone fruit, herbs, and an orangepeel note. Medium-light bodied with a bright texture and finish. Navarro 2012 Chardonnay, Mendocino County. Sourced from three Mendocino appellations, with 50% estate fruit and 50% malolactic fermentation. Light straw color, with apple and pear fruit, lees, and spice on the nose. Medium-light weight and lively on the palate, with a clean finish. Navarro 2012 Chardonnay, “Première Reserve,” Anderson Valley. Entirely from Navarro's Hammer Olsen Vineyard, fermented and aged in 25% new French oak. Light yellow/straw color, this displayed pear and stone fruit, earth, and toasty oak on the nose. Medium-bodied with a creamier texture than the previous wine but retaining fine acidity, with a long, lively finish, nice. Navarro 2013 Gewürztraminer, “Dry Cuvée Traditional,” Anderson Valley. 0.28% residual sugar. Very light color, aromas of citrus, white peach, and flowers, along with lots of spice. Medium-light weight in the mouth, this finished with a hint of sweetness. Comments: One of the earlier modern Anderson Valley wineries, Navarro was founded by Ted Bennett and Deborah Cahn. In 1974, they began planting their estate vineyard near Philo with Gewürztraminer, Pinot Noir, Riesling, Muscat, and Chardonnay. 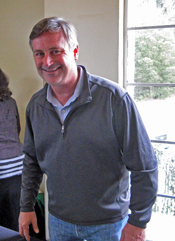 Winemaker Jim Klein has been at Navarro since 1992. I had tasted Navarro’s current Pinot Noir Rosé and several vintages of “Méthode à l'Ancienne” Pinots recently, and they continue to produce solid wines across the board. Parducci 2010 “Coro Mendocino,” Mendocino County. 55% Zinfandel, 30% Petite Sirah, 10% Syrah, 5% Grenache. Medium-dark color, showing lots of black pepper along with plum and blueberry fruit, earth, and a touch of vanilla/oak. Medium weight on the palate with a lively texture and firm tannic finish – needs more bottle age but shows promise. Comments: Parducci Wine Cellars is located just north of Ukiah, and was founded in 1932. The Parducci family has not been involved with the label since the 1990s, and there have been ownership changes since then. Bob Swain is the winemaker. This wine was tasted at the Coro Mendocino table. Skylark 2013 “Pink Belly,” Mendocino County. Made from Grenache grapes farmed for Rosé and whole-cluster pressed into stainless steel. Light salmon/pink color, this featured strawberry and herb aromas. Lighter-bodied with a bright mouthfeel and clean finish. Skylark 2013 Pinot Blanc, Orsi Vineyard, Mendocino County. From vines planted in 1975, whole-cluster pressed into stainless steel, with no malolactic fermentation. Light color, with pear and stone fruit aromas, spice, and a touch of fresh herbs. Medium-light weight with a juicy texture and crisp finish, nice. Alondra 2010 Chardonnay, Middleridge Ranch, Mendocino County. An un-oaked Chardonnay with no malolactic fermentation. Very light color, showing pear and lees notes along with a slight floral note. Medium-light bodied with a lively mouthfeel and finish. Skylark 2012 “Red Belly,” North Coast. 38% Grenache, 35% Syrah, 27% Carignane. Medium-light purple, this had lots of black pepper along with red fruits and dried herbs on the nose. Medium-bodied with a vibrant texture and moderate tannins, nice. Skylark 2010 Grenache, Mendocino County. About 91% Grenache sourced from Sawyer Vineyard above Ukiah and 9% Syrah from Stagecoach Vineyard in Napa Valley, fermented with around 5% whole clusters and aged entirely in older oak. Medium-light color, plum and black cherry fruit plus earth and pepper aromas. Medium weight in the mouth, with plenty of structure and grippier tannins on the finish. Skylark 2009 Syrah, Rodgers Creek Vineyard, Sonoma Coast. From a “suitcase” Côte-Rôtie clone, with about 33% whole-cluster fermentation and 30% new French oak. Medium purple color, this was very savory, with meaty, smoky aromas, herbs, plus blackberry and earth notes. Medium-bodied and lively on the palate, with a firm tannic finish – showing great character now but has the structure for more bottle age. Skylark 2009 Syrah, Lawer Vineyard, Knights Valley. Fermented with 27% whole clusters and aged in 25% new oak. Dark color, this displayed upfront black fruits, spice, and vanilla/oak on the nose. Richer mouthfeel, with grippy tannins on the finish. Comments: Skylark was founded in 2002 by John Lancaster and Robert Perkins of Boulevard Restaurant in San Francisco. Alondra is a second label – it means Skylark in Spanish. Robert poured a very solid group of wines at the tasting. Tahto 2013 Sauvignon Blanc, Bauer Vineyards, Mendocino County. From the estate vineyard. Very light color, this showed bright apple and citrus fruit with a hint of fresh herbs. Medium-light bodied with good acidity and a clean finish. Tahto 2013 Rosé, Mendocino County. From about 60% Syrah and 40% Grenache from Trail’s End Vineyard in Potter Valley. Light salmon/pink color, with earthy raspberry and spice on the nose. Medium-light weight with a fairly smooth texture and finish. Tahto 2010 Syrah, Piffero Vineyard, Mendocino County. Medium-dark color, featuring ripe blackberry fruit, herbs, and lots of spice. Medium-bodied with a fairly lively mouthfeel and chalky tannins on the long finish. Tahto 2010 Petite Sirah, Johnson Vineyard, Mendocino County. Dark color, this displayed earthy, gamey, and very peppery aromas upfront, with dark berry fruit and spice in support. Richer and more structured on the palate, finishing with firm tannins – a tasty and intriguing wine that could develop nicely with more time in the cellar. Comments: Tahto is the label of Wayne and Anne Bauer, who purchased property in Potter Valley in the late 1990s and planted Sauvignon Blanc there. Wayne has been making wine since the early 1980s and sources fruit for the Tahto wines from nearby Ukiah Valley and Redwood Valley as well as Potter Valley. Testa NV “White,” Mendocino County. Mostly from 2013 fruit, with 47% Sauvignon Blanc, 24% Chenin Blanc, 18% Viogner, and 11% Muscat Canelli, made in stainless steel. Very light straw color, this displayed ripe stone fruit and tropical fruit notes along with distinctive floral Muscat aromas. Medium-bodied with a smooth texture and finish. Testa 2013 Rosé, Mendocino County. From about 75% Carignane and 25% Zinfandel, made in stainless steel. Light salmon/pink color, with subdued strawberry and spice on the nose. Medium-light weight, with a fairly lively texture and a hint of tannin on the finish. Testa 2010 Charbono, Mendocino County. About 90% Charbono from 60+ year old vines along with 10% Petite Sirah, aged in neutral oak. Medium-dark color, featuring slightly floral aromas plus dark berry fruits, earth, and black pepper. Medium-bodied with good structure and moderate tannins, nice. Testa 2010 “Black – Tre,” Mendocino County. 38.5% Cabernet Sauvignon, 32% Carignane, 24.5% Petite Sirah, and 5% 2009 “Black – Due,” aged in neutral oak. Darker color, this showed plum and darker berry fruit, earth, spice, and dried herbs on the nose. Fairly rich mouthfeel with moderate tannins, a good basic red blend. Comments: Winemaker Maria Testa Martinson’s great-grandparents Gaetano and Maria Testa first planted their family’s vineyard in Calpella near Redwood Valley in 1912. It’s planted to Carignane, Petite Sirah, Zinfandel, Barbera, Grenache, and Charbono. Although the family has farmed winegrapes for over a century, they only began making their own commercial wines a few years ago. Via 2013 Tocai Friulano, Fox Hill Vineyard, Mendocino County. From a vineyard near Ukiah, whole-cluster pressed, fermented and aged in neutral French oak with no malolactic fermentation. Very light straw color, this showed bright stone fruit and melon aromas, with a hint of lemonpeel. Medium-light bodied with a lively mouthfeel and finish. Via 2013 Rosé of Nebbiolo, Fox Hill Vineyard, Mendocino County. Pressed after four hours of skin contact, fermented in stainless steel and aged in neutral French oak. Very light salmon/pink color, with floral and savory notes along with cherry and earth on the nose. Medium-light weight on the palate with good acidity and a slight tannic bite on the finish – a very distinctive and intriguing Rosé. Comments: Via is the project of Campovida winemaker Sebastian Donoso and his wife Sara. The 2012 vintage of Tocai Friulano was Via’s first release. Production is tiny, and currently the Via wines go almost entirely to restaurants. 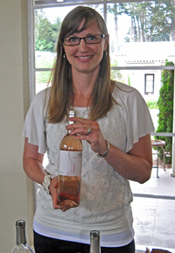 Sara poured the wines at the event, and both were distinctive – should be worth keeping an eye on this new label. Waits-Mast 2011 Pinot Noir, Mendocino County. Sourced equally from Londer Vineyard in Anderson Valley and Oppenlander Vineyard a few miles farther north. Medium ruby color, this featured earthy and spicy aromas upfront, along with black cherry and raspberry fruit and s slight floral note. Medium-light bodied with fine acidity and moderate tannins.